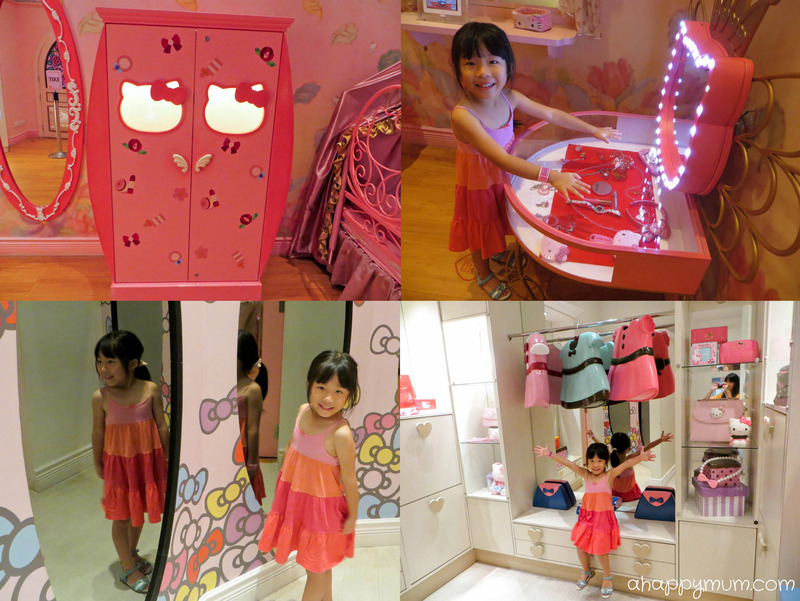 Our decision to visit Sanrio Hello Kitty Town was a spontaneous one but not one that we regretted in the least. That was because the girls had such a ball of a time and returned with countless fond memories that will last them for a long, long time to come. 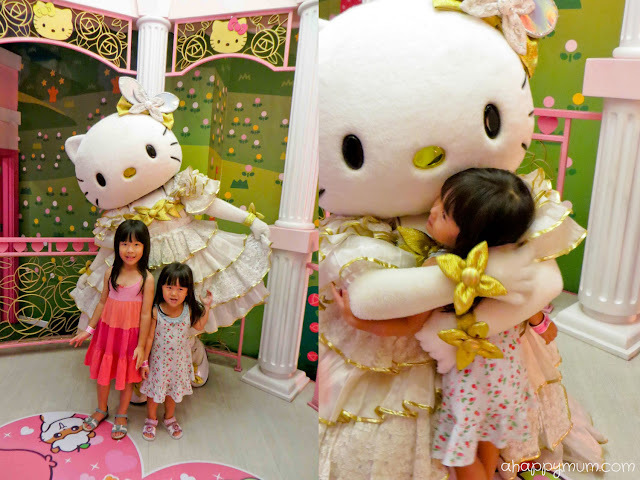 The thing about Hello Kitty Town is that it is more catered for girls, and not for big girls above age of 8 who might find the activities a little boring, but small girls who are still easily fascinated and in love with cute mascots, kiddy games and girly activities. I'm not saying that boys cannot visit, just that they probably won't enjoy it half as much as their sisters. On the other hand, I myself did enjoy doing most of the things with my girls and as for the hubby, it was just awesome of him to be the one to suggest to bring us there and stayed with us throughout. 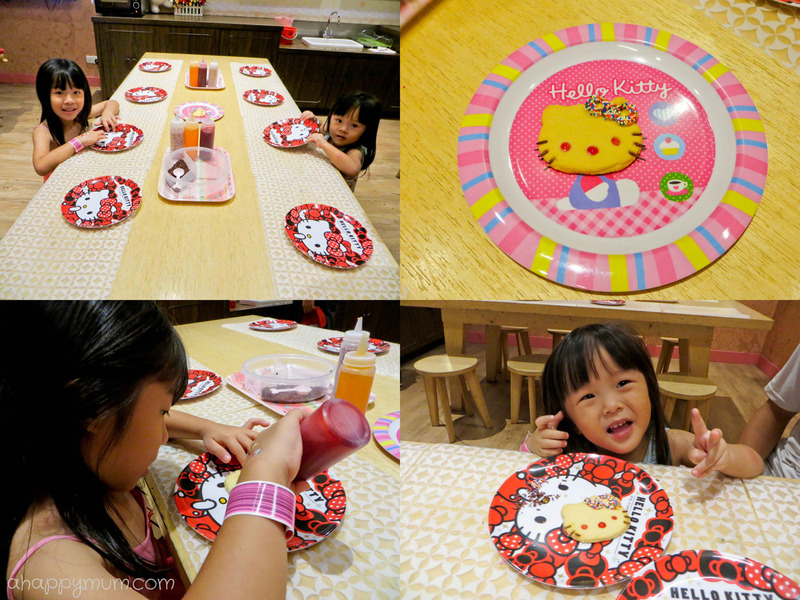 Today, for those who are in love with this white Japanese bobtail cat with the red bow or wondering where to bring your kids for some family fun, I'm bringing you on a tour around Hello Kitty Town! 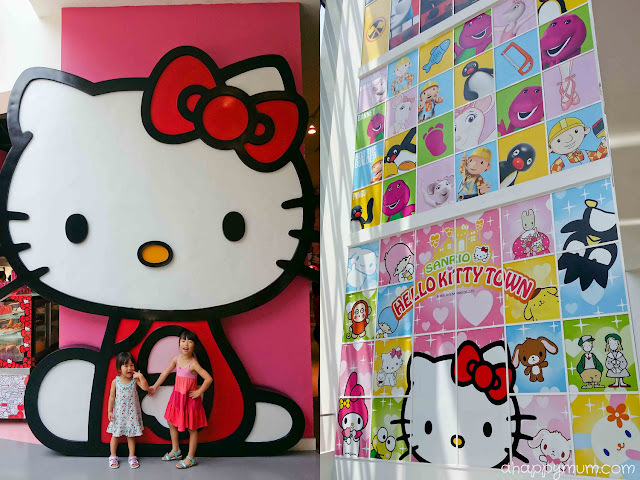 Located in Nusajaya Johor, The Little Red Cube is a shopping and family entertainment destination fronting the marina at Puteri Harbour and houses two family attractions - Sanrio Hello Kitty Town and The Little Big Club. It takes a short 20-minute drive from the Malaysia-Singapore Second Link in Tuas for visitors to get here. As the first one outside of Japan, Sanrio Hello Kitty Town consists of various interactive and walk-through themed activities and boasts the biggest official licensed Hello Kitty merchandise store in Malaysia. The Little Big Club spreads over two levels, offers interactive and engaging rides for families with young children and features popular characters like Bob the Builder, Barney, Angelina Ballerina, Pingu and Thomas & Friends. Since we only had an afternoon to spare, we decided to skip the 2-park pass and focused on exploring Hello Kitty Town for the day. One good thing about this attraction is that it is fully indoors! That means kids can feel free to have fun, be it rain or shine outside. After having been in the hot sun for two whole days in LEGOLAND, we totally welcomed the air-conditioning and the shelter. This is the entrance to Sanrio Hello Kitty Town! Bright pink, heart shapes, cute characters, cosy ambience - it's like a dream come true for every little girl. 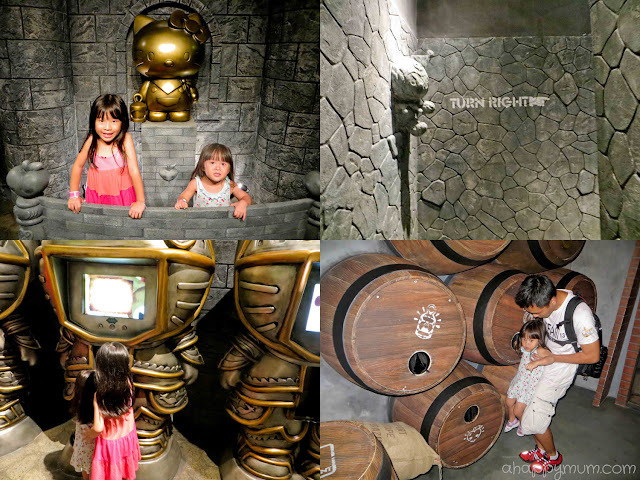 Even though the place is not huge, there are definitely enough activities to keep the kids occupied for a day of fun. One good thing about us being there on a Monday morning was that there was no crowd and we practically didn't need to queue up for the activities! Have you ever wondered what kind of house Hello Kitty lives in? 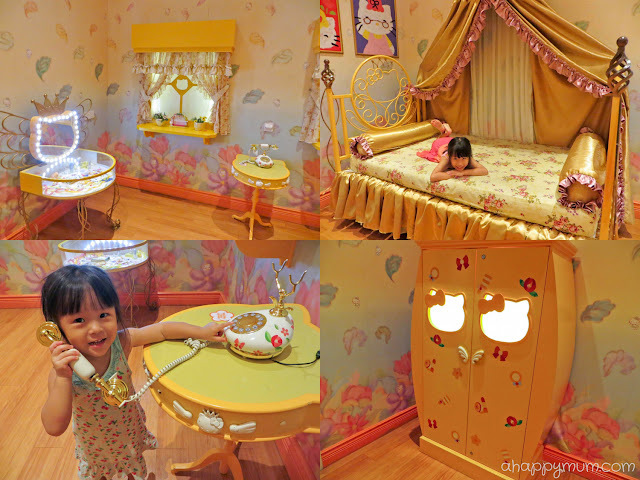 We managed to take a tour in this whimsical house that Hello Kitty shares with her twin sister Mimmy (bet you didn't know that she had one, right?). Isn't that a cute family portrait of Hello Kitty? Similar to what many attractions offer, there will be a photographer who will help you to capture some shots for your family when you enter Hello Kitty's house. Of course, this is in the hope that you will purchase one of their professional photography packages before you leave. The good news is they will oblige too if you request for them to use your camera to take some pictures instead. I love the cute chairs at the dining table and the enormous Kitty screen! For the kids who would like to play some interactive games, there are computer stations set up for you to explore and have fun, including answering questions like "What is the colour of Hello Kitty's bow?" etc. The kitchen was one of our favourite parts of the house and in fact, the kids enthusiastically asked "Can we play cooking here please?" when they saw all the beautiful cutlery, appliances and 'food'. 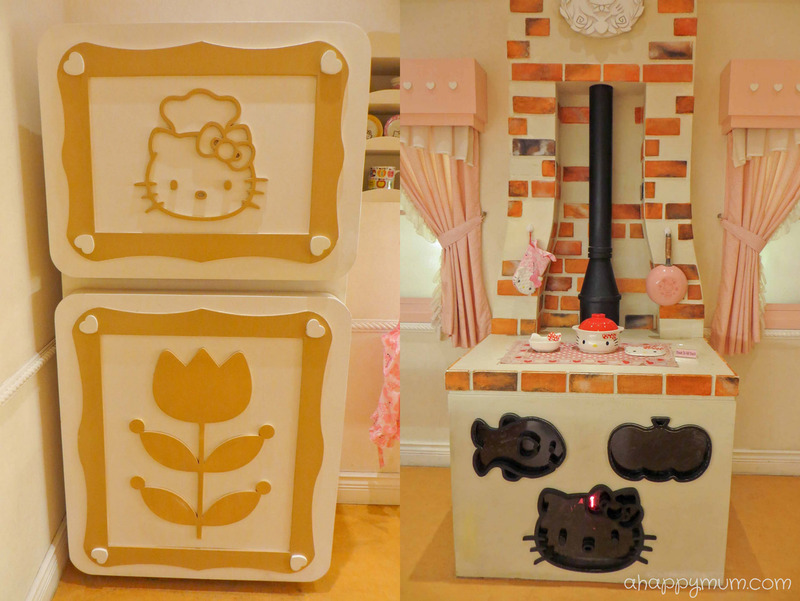 Seriously, a Hello Kitty refrigerator and even a stove? I definitely never imagined how they would look like. As for the bathroom with the huge, inviting Hello Kitty tub, I think if we had one at home, I would never need to holler more than once for them to rush to take their baths happily. Thankfully, there was no one in the line waiting to get into the tub and these two lazed, sang, danced and played to their hearts' content. Last but not least, the bedrooms! These were a tad overly decorated for my liking but it was definitely interesting to see what things were lying in Kitty's wardrobe and on her dressing table. 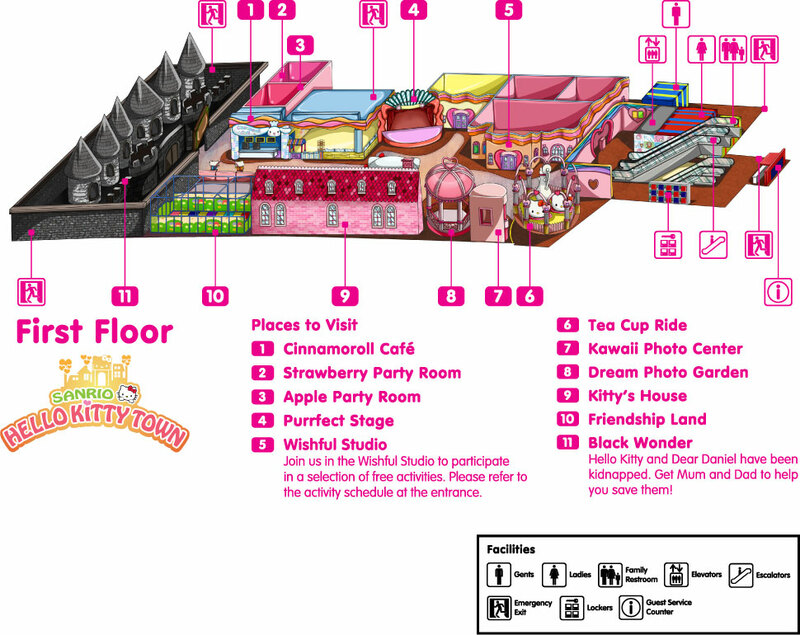 If you are thinking that there will be many kiddy rides in Hello Kitty Town, well, actually there is only one - the Tea Cup Ride. The rest of the activities are more interactive in style which I personally prefer since we had already been on dozens of rides previously. For the little ones who would like to run around and shoot some balls, there is also a small play area located inside Hello Kitty Town. Surprisingly, we spent a good half an hour here, just picking balls and throwing them at each other (actually, it was the three of us against Daddy). Well, one good thing about becoming parents is that it allows you to relive your childhood at times too, don't you agree? Knowing how much the kids love song and dance performances, we were really looking forward to the stage shows. After all, it isn't always that you get to watch Hello Kitty and Friends put on a special performance just for you, right? 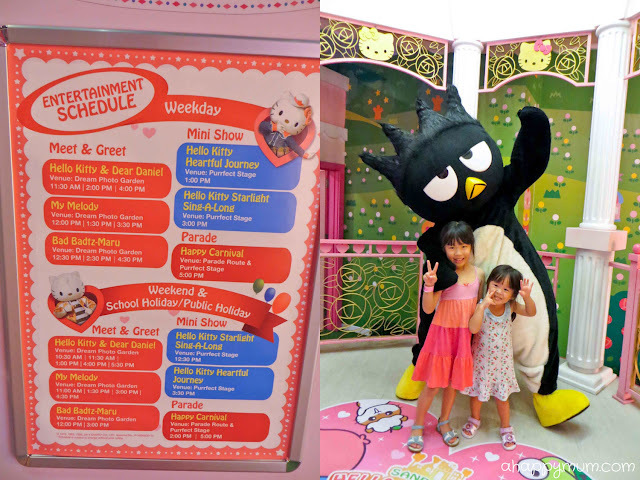 There are two shows daily - Hello Kitty Starlight Sing-A-Long and Hello Kitty Heartful Journey. Timings differ for weekdays and weekends, refer to the schedule here. The girls were totally looking forward to the activities in the Wishful Studio and it was not hard to understand why. Decorate your own cookie, get a manicure , make your own bracelet,and dress up as your favourite character - not many girls will be able to resist that, right? Though we didn't get to bake the cookies, we were able to decorate them with jam and sprinkles and once they were done, we gobbled them all up. The girls are in the stage where they totally love to get some colour on their nails and when they knew they had the opportunity to do so here, you bet they were ecstatic. The funny thing was that the staff only provided the nail polish and equipment for us to DIY, therefore the hubby and I became manicurists that afternoon just to make our darlings happy. Making your own bracelet essentially means just hanging the charms onto the chain, which took us only a couple of minutes. Still, we were happy to know that these were for us to keep and bring home! One of my most enjoyable moments was that I got to spend some one-on-one time with the big girl and we did a mother-and-daughter photoshoot. In Hello Kitty costumes, no less. Meet and Greet sessions never fail to excite the kids, right? 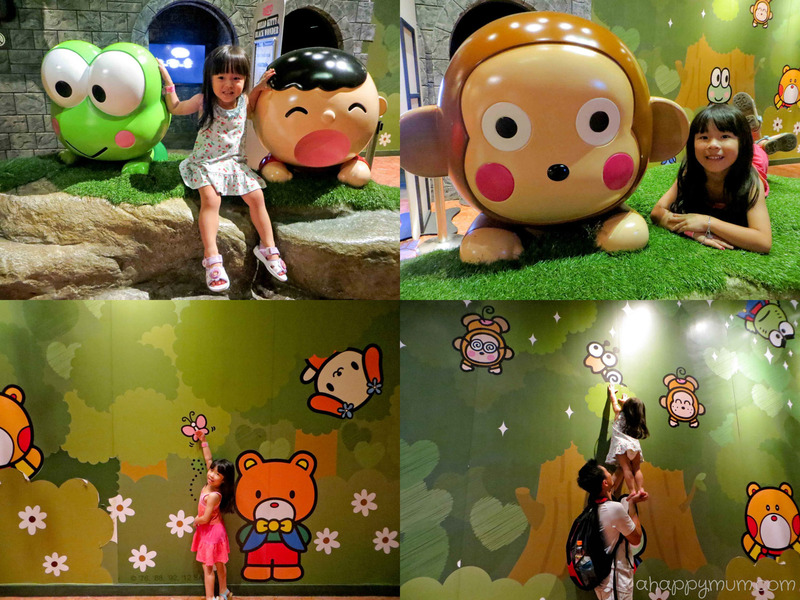 Better still if you get to high five, hug and even kiss these adorable characters. That was precisely what we did with every character we saw and since it was a quiet morning, they were very kind to grant us some extra time too. 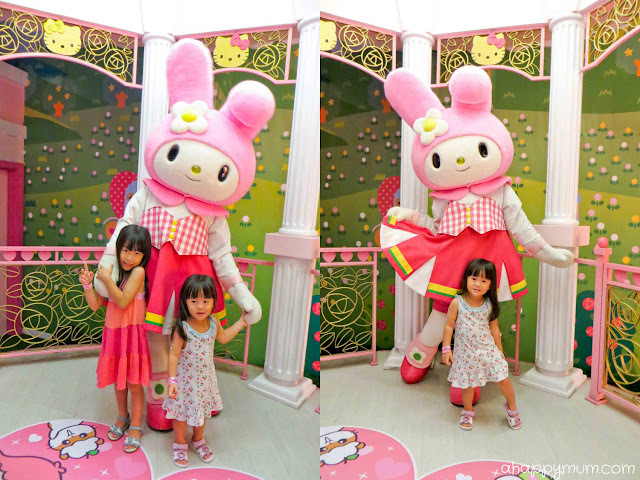 From Hello Kitty and Dear Daniel to My Melody and Badtz Maru, the girls loved them all. For the Meet & Greet schedule, go here. And yes, you can use your own camera to snap pictures of your kids! This was the most challenging and mind stimulating activity of all and we thoroughly enjoyed it. 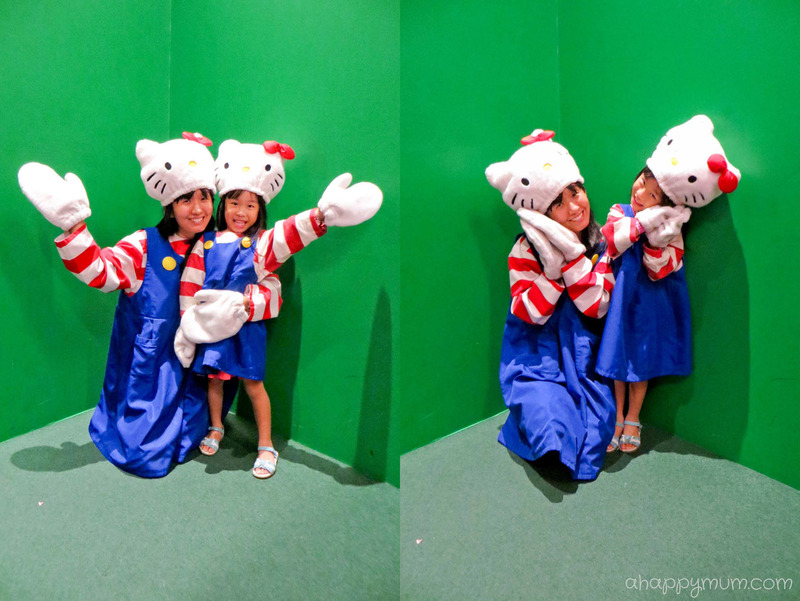 Visitors are divided into groups and have to solve a series of clues in order to rescue Hello Kitty and Dear Daniel who have been kidnapped. Besides having to answer questions, you will be required to go through a small maze and decode puzzles too. Every group will be allocated a different symbol and players have to enter different rooms, solve tasks, find their own symbol and obtain a corresponding letter. At the end, you will have gathered five letters, all jumbled up, and have to rearrange them to get the final solution. Although it might not be too complex for adults, it definitely had a certain level of difficulty, even for the older kids. To celebrate our victory after solving all the clues, we took pictures with the cute Sanrio characters (Keroppi, Monkichi and Minna no Tabo, anyone loves them?) right outside Black Wonder and the girls even tried to scale the wall to give high fives to all their friends. If you need a drink or some food to recharge, you can do so at the Cinnamoroll Café located inside Hello Kitty Town or visit Red Bow Café on the ground floor. To my surprise, the food was quite reasonably priced and it was a treat for us to have the picturesque café all to ourselves while having an afternoon tea. There is also a toilet conveniently located at the entrance so you do not have to walk too far. Check out the signboard and cubicle doors, you can't miss them! If you are looking for souvenirs or gifts, then a trip to the merchandise store located on the ground floor is a must. There is a diverse selection of products available and bound to be something that you will be tempted to buy. This was the part that we loved the most - and almost missed! The hubby initially wanted to go off earlier so as to avoid the jam but since the parade was starting in half an hour, I pleaded for him to let us finish watching it and we would depart immediately. Being the nice father and husband, he agreed and so I even woke Ariel up from her nap just so she could catch this finale. Woohoo! The characters danced their way in from the entrance and pleasantly surprised us! Since there were not many kids present, the girls also got the chance to get close with the dancers and I could see how truly happy they were as they twirled and span. Was it worth it? Yes, absolutely. To see all the characters gathered on stage in their fanciful costumes and be able to dance alongside, give them goodbye hugs and kisses, I know that was something that left behind beautiful memories in the kids. Lastly, here are some of our precious memories from our visit! We'll definitely love to come again but that will have to soon or there's a chance that the girls might outgrow their love and interest for such activities in a few years' time. Till the next visit! Driving directions can be found here. For more details and online ticket purchase, visit www.playtime.com.my/hello-kitty-town. Love the photos; the big giant Hello Kitties are so huge!